Like everyone else, I'm feeling the utter grayness of winter. I went a little crazy trying to brighten our dining room today. 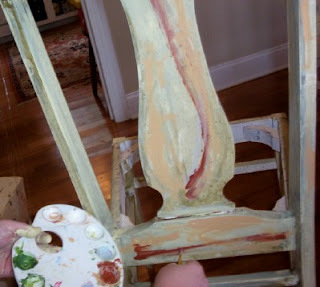 I've been meaning to paint these chairs for a while now. 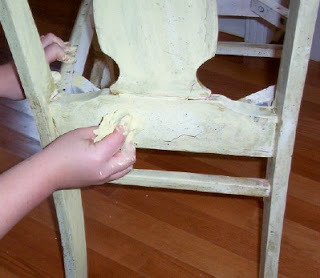 Like the table they came with, their finish was chipping and peeling unattractively. I rubbed a thin layer of green paint on with a paper towel. Then I used some butter yellow on top, again with a paper towel. I'm low-tech! I thought I would swoop some color around for highlights, then blend it into the yellow. Only I liked the raw color so much, I left it in bold streaks. I'm pretty sure my husband won't get it, but I think it adds a fun, artsy touch to an otherwise drab room. Right now I better get the staple gun and recover the chair seats. If I were you, I would protect those beautiful wood floors when painting! Just a thought! You could pass for a homeschooled teen in that apron, Meredith!! I think you have inspired me to paint those chairs I just recovered:) Of course, mine are metal so it would be with spray paint and it's awfully cold outside.... maybe in March? LOL. I never would have thought of doing that, but it's beautiful. 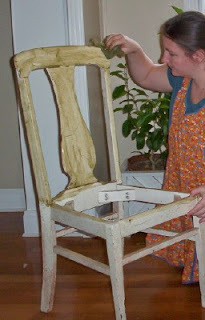 I have an old wooden chair that I might try painting. I love your blog - it has really changed the way I look at my home! I have been reading your blog the last week and I really enjoy it too. Alot of great ideas. Your frugal, but you dont look cheap! You look great! So what did your dh think? That is so neat!! Thanks for sharing the pictures and describing how you did that. 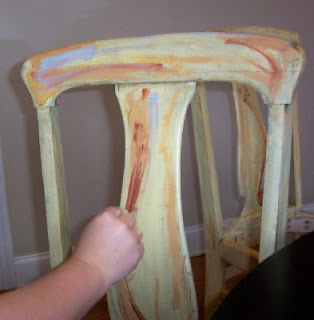 I'm a fan of low-tech creativity and have a special fascination for sprucing up old chairs.